one crumb at a time: Food Inc. Imagine taking Jean Anthelme Brillat-Savarin with you to the supermarket and then buying him lunch at the local drive through take away on the way home. Having shown him what you were eating what would he tell you about what you are? Any day in the newspaper we can read about what our diet is doing to us as individuals – obesity, diabetes, heart attacks, bowel cancer, even the mental health of our children, all linked to what we put into our bodies. Tell me what you eat and I will tell you that you are fat and unhealthy. But what we eat has far wider reaching and more insidious implications. What we eat also tells us what we are as a society. What we eat reflects our values and defines our culture. 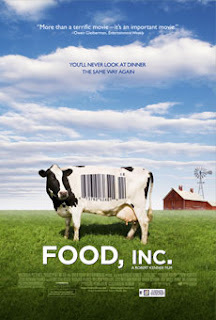 And if you are concerned about what those values are you should go and see Food Inc. Essentially the words of Eric Schlosser (Fast Food Nation) and Michael Pollan (In Defense of Food and The Omnivore’s Dilemma) with pictures, Robert Kenner’s film aims to ‘lift the lid on the food industry’ by exposing the greed of the huge corporations who bring us the food we eat with, he contends, the collusion of the USDA (The United States Department of Agriculture) and the FDA (the Food and Drug Administration). Kenner sets out to demonstrate that the food industry puts profit ahead of the health of consumers, the livelihood of farmers, the safety of workers and environmental concerns by considering a wide range of issues associated with food production including the omnipresence of corn syrup in the food chain, how the animals we eat are raised and killed, genetic engineering, cloning and food contamination. Schosser and Pollan both appear in the film along with Joel Salatin (who farms poultry and pigs in the Shenandoah Valley and features in The Omnivore’s Dilemma) and individuals who do try to make a difference – the mother whose son died from eating contaminated hamburgers and now acts as a lobbyist, the seed cleaner who in his own quiet way tried to take on Monsanto, the family that simply can’t afford to eat healthy food and the organic yoghurt manufacturer who has converted WalMart. There are also fairly graphic scenes of how meat is processed which won’t appeal to the squeamish or the vegetarian. Whether this is a good documentary or not is open to discussion but I would hope that it will bring the issues raised by Schlosser and Pollan to a wider audience and make more people think about the choices we make when it comes to the food we eat. And perhaps more importantly make people realise that there are choices to be made. It can’t be denied that the industrialisation of food production has changed the world we live in. Eating, the food we choose to eat and the food available to us, have always had political and social implications but it is worth remembering that we do get the opportunity to vote three times a day. This is a very American film and of course all the examples and statistics refer to the USA. If you have read Eric Schlosser's book you will know that some of the things he talks about - fast food chains sponsoring school canteens for example - simply do not happen here. But that isn't to say that they couldn't. What is happening here in Australia? What effect has fast food had on food production here? What do you know about GM crops in Australia? Who controls meat processing in Australia? What do you know about the effect of mining operations in the Hunter Valley on local food production? Do you know who manufactures the food you purchase at the supermarket? Don’t assume that Food Inc. won't/doesn’t happen here.